thank you all for your lovely wishes about my starting to teach more knitting… my first class was friday. i was supposed to have 4 students, but i ended up with 3.
this sweater worked its magic wonderfully. i delivered waterfall to emily (happy birthday! ), who also got into handmade arcade, and then, i spent yesterday spinning on the front porch with lauren. all in all a good weekend. now to bake some blueberry muffins and it will be complete. what fibery goodness has happened in your life lately? tea for two on the porch, anyone? 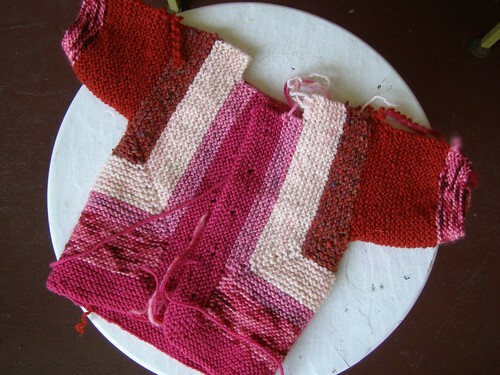 This entry was posted in cosyknitsliterally, knitting, teaching by cosymakes. Bookmark the permalink. Great photos! 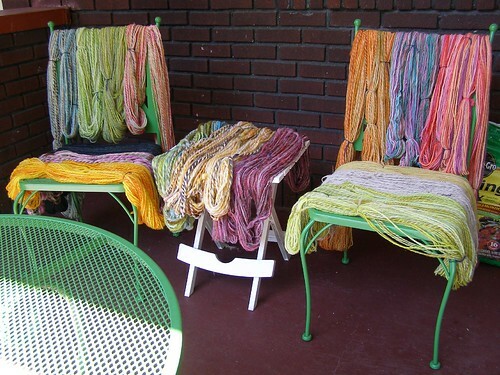 I’m teaching my first knitting class later this month, a beginning cable class. Congrats on teaching. You’ll get more students and then you’ll wish for less. Ask me how I know. ;) I really prefer one-on-one because then you can really drive the lesson in.